Following the now standard recap of what happened two days ago at the first semi-final, it was time for semi-final two. I missed the live broadcast at the time as I had to get some sleep before setting off on holiday in the middle of the night. 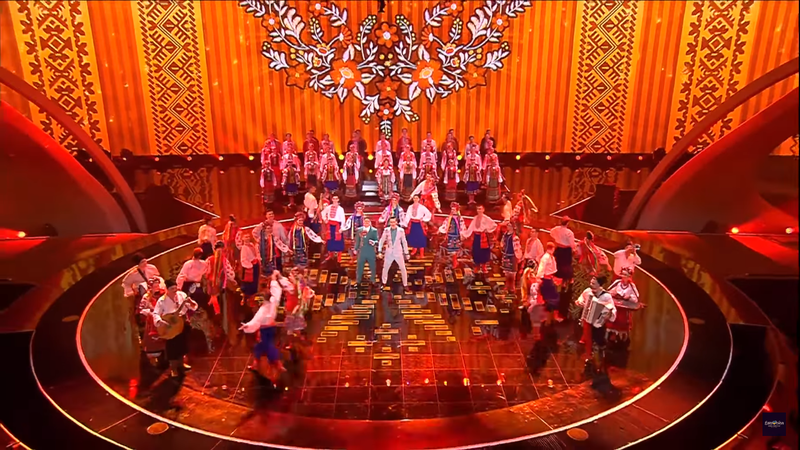 Alex and Vova kicked off the show with quite an entertaining Ukrainian-style Eurovision medley with folklore dancers and musicians, ending with an emotional "Rise Like A Phoenix". This song had never appealed to me since first hearing. 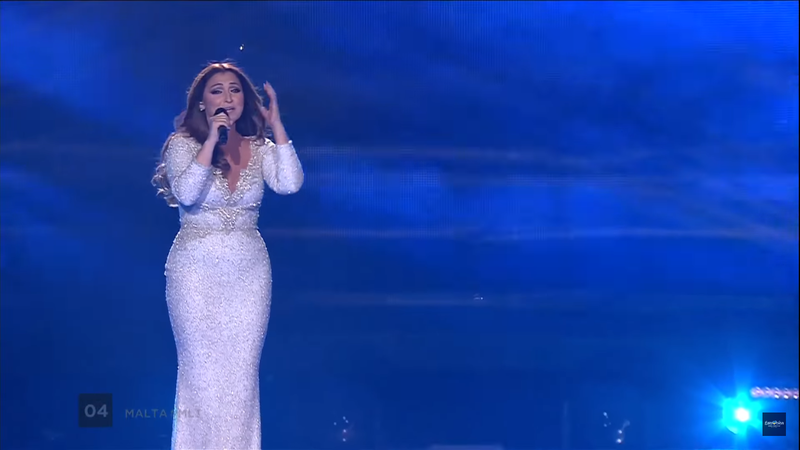 I would always expect something special from Serbia at ESC with some kind or originality or national characteristic. Instead we got "Walk On Water II" and I really couldn't stand that song. Tijana, in a see-through floaty dress, looked uncomfortable throughout and the whole package just didn't give anyone any reasons to vote for this entry. I was therefore surprised to see that it closely missed out on a qualifying place. This was written by the same songwriting team who wrote this year's entries from Bulgaria and FYR Macedonia. That kind of thing really gets on my nerves, but I'll rant about it some other time. For me, Nathan had been one of the most likeable characters of the pre-season, with his high profile at all the promotional events. Nathan didn't do much running here but the crescent moon staging was quite sweet. The song itself was average rather than great, but Nathan delivered it with such enthusiasm and I was glad to see him make the final and defy the running-order curse. FYR MACEDONIA: "Dance Alone" - Jana Burčeska. Jana delivered one of the most unique postcards yet as she revealed her pregnancy! For me this was one of the more likeable dance-pop songs at this year's contest, although I had to level the same criticism at this as the Serbian entry as it could come from anywhere; there was no defining national flavour. What it did have was that "HEY!" which seems to turn up in many a modern pop song these days. But her delivery fell short of what was required of the song; she didn't deliver a believable performance and there was just something missing from the whole package. Another song with an egomaniac LED music-video backdrop of the performer. I really don't like this trend. Claudia finally got the chance this year to represent her country. This ballad may have been a bit too old-fashioned for the modern contest, but you couldn't deny that she delivered a very professional and faultless performance, which oozed class. 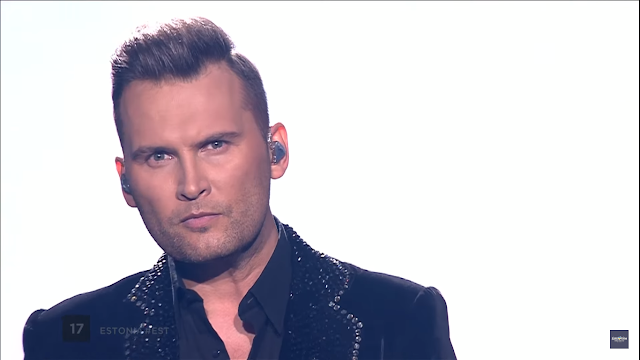 The song just didn't have any televoting appeal at all. ROMANIA: ""Yodel It!" - Ilinca and Alex Florea. And now from class to trash. Yodel It! divided the fan community this year. Some loved it, and some hated it with a passion. I was definitely in the latter camp. Now you know I'm all for either native language or national characteristics, but a Romanian duo performing a rap/yodel combination just left me baffled. When this trio were announced to represent the Netherlands, I was incredibly excited at this news. Amy, Shelley and Lisa are very talented singers and their harmonies are unique and exquisite. Although they deserved a much better song than this to showcase their vocal talents, I understood that this was a very personal song to them, written about their mother's struggle with her illness. They performed the song with their usual professionalism and faultless harmonies. This was one of the songs which I had probably ignored before the contest and I couldn't get into it at all. 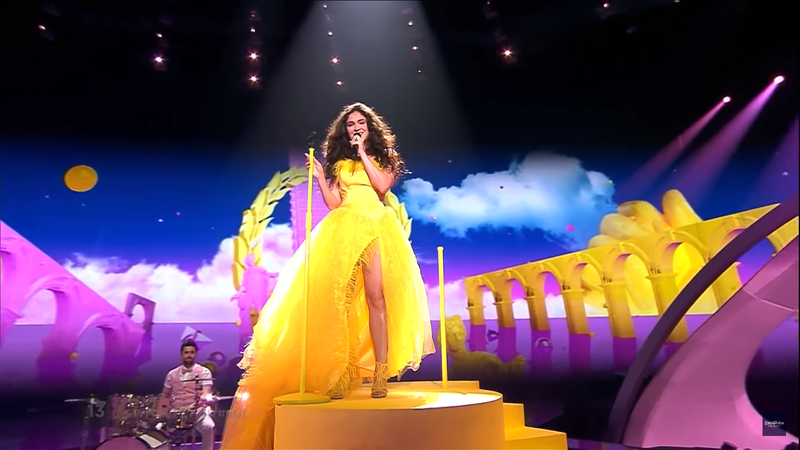 However, in similar style to Armenia, which has the awesome skill of transforming an entry with an unforgettable visual presentation, Hungary absolutely got it right here and I finally sat up and took notice. DENMARK: "Where I Am" - Anja. An Australian entry in all but name, Anja finally succeeded in representing Denmark. The staging and the pyro curtain finale matched the performance quite well, although this wasn't much of a song in my opinion. IRELAND: "Dying To Try" - Brendan Murray. Brendan was previously a member of Irish boyband Hometown, masterminded by Louis Walsh. So it was no surprise really that in an internal selection masterminded by Louis Walsh, he chose Brendan. Unfortunately from the minute this song was revealed, it was under fire in the fan community. 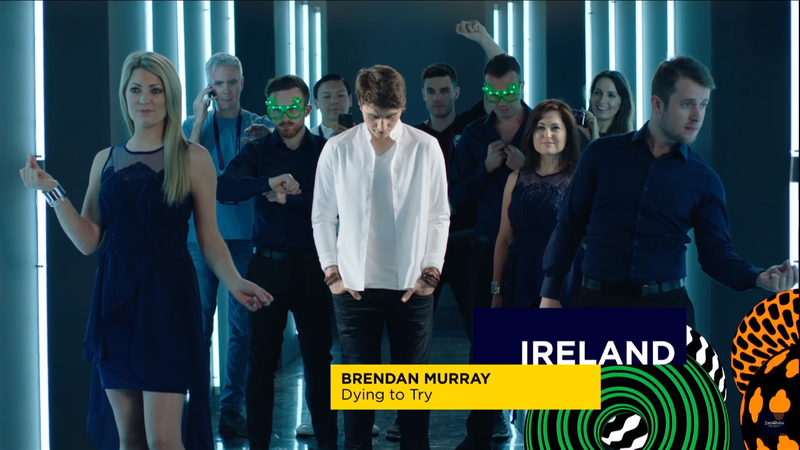 The problem with "Dying to Try" (co-written by Jorgen Elofsson) is that it sounds like a dated boyband album track, the one in which the young, cute one (not the lead singer) finally gets the chance to take the lead. For some reason they had Brendan standing on a hot air balloon prop. SAN MARINO: "Spirit of the Night" - Valentina Monetta and Jimmie Wilson. Aww bless. You can't have San Marino at ESC without Valentina, can you? So she came back again this time accompanied by musical theatre performer Jimmie, and together they took us back to the disco days with call-and response lyrics and energetic moves. Unfortunately it's not 1977 but 2017, so when it came to voting time there wasn't much love for this Ralph Siegel co-write. However, I do have a soft spot for this; it wasn't the worst song of the evening. Maybe now that a jazz-flavoured song has won ESC, Valentina might want to come back again and finally sing something in her own style! Where to begin with this? Jacques was a buy-one-get-one-free combination of r'n'b balladeer and opera singer, and the split-personality song had enough novelty value to make people vote for it. However it had no appeal for me whatsoever. Apparently Jacques had made some allegedly homophobic remarks earlier in his career so he found himself backtracking rather a lot after being selected for Croatia. As if to labour the point, he then ended the song with a big rainbow display on the arch covering the stage. NORWAY: "Grab The Moment" - JOWST featuring Aleksander Walmann. 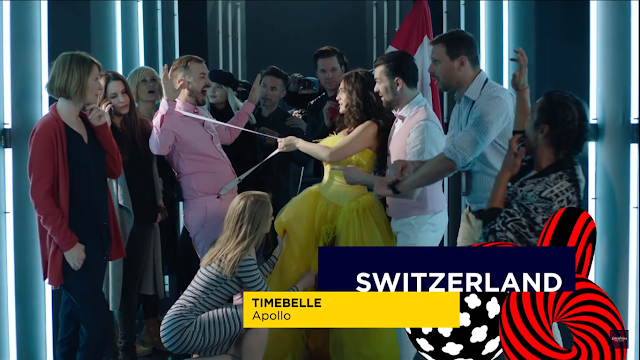 One of this year's most contemporary entries from a country which has brought two of the top dance acts of the past couple of years (Kygo/Alan Walker) so it was interesting to see them send something in that very current EDM style with a twist - the particular "X factor" here being Aleksander Walmann who managed to bring warmth to the cool electronic beats. Sebalter excepted, Switzerland continue on their merry way and maintain their reputation as every year's Eurovision "fillers" and failures. Trying to say something positive here, this was at least better than "The Last of Our Kind" - it wouldn't be hard, but the combination of the overpowering yellow styling and the stupid lyrics of the song had this near the bottom of my annual ranking. (OK then, I don't do an annual ranking but if I did, this would be near the bottom of it). 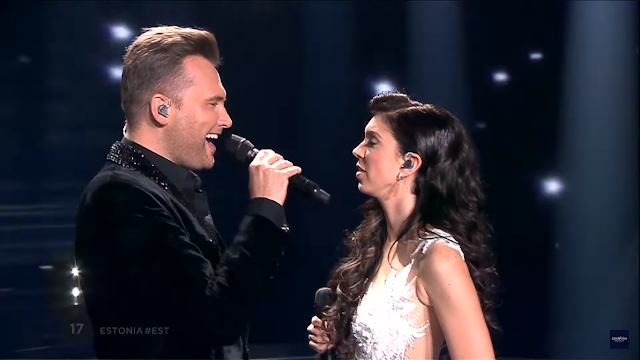 Please, please, please Switzerland, send something good to Eurovision, It can't be that difficult. This is a great story. 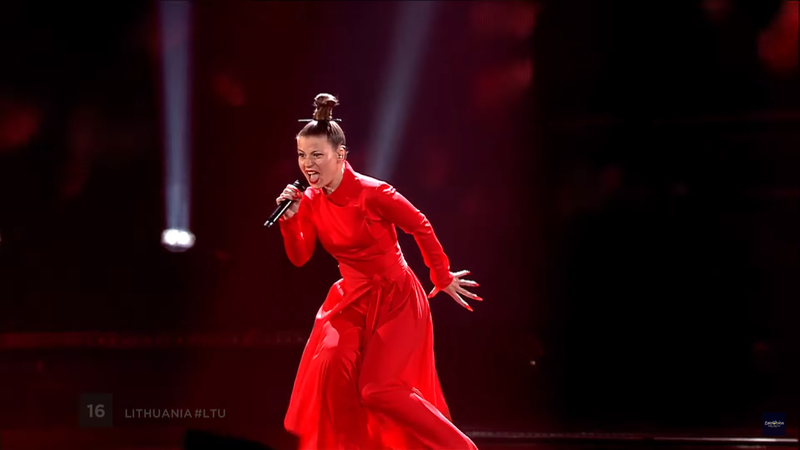 Belarus had sent an entry to ESC in their national language for the first time ever, and it was just a little joyful explosion of hey-heys. I originally had this down as a non-qualifier based on the fact that their qualification rate is not the best, but the charm and happiness radiating from this charismatic couple definitely floated the voters' boats. A 17 year old young man (who only looks about 12!) with a vocal maturity beyond his years, Kristian went into the contest as one of the favourites. Thanks to Poli's excellent result last year, Bulgaria is now rated at Eurovision and is likely to win within the next few years if they get the mixture of song and performer just right. 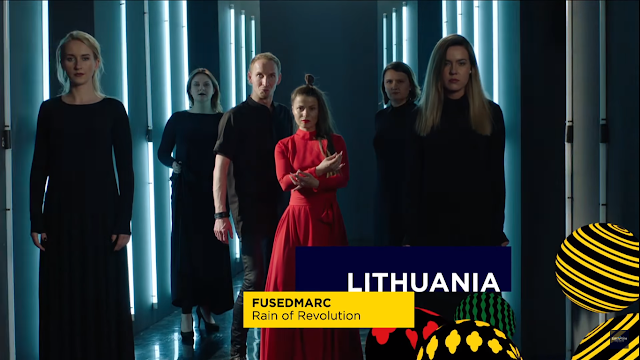 Lithuania has an interminable annual selection which goes on for weeks and months only for the process to deliver yet another also-ran. YEAH YEAH! YEAH YEAH! YEAH YEAH! They do have an impressive diaspora vote so that was the only reason I had this down as a qualifier. It started off with all the right moves and funky foot-tapping rhythms and then went nowhere and turned into a mess. NO NO! NO NO! NO NO! NO NO! 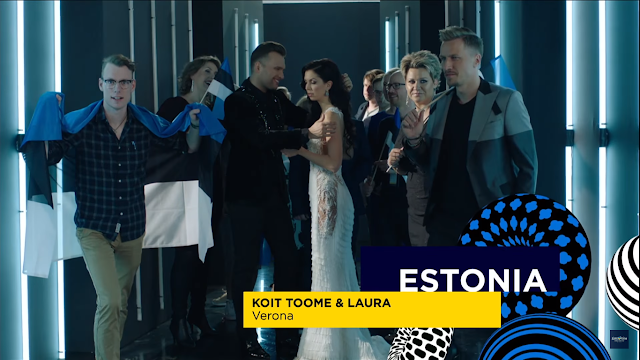 I wanted this to be a qualifier, well, because Estonia. 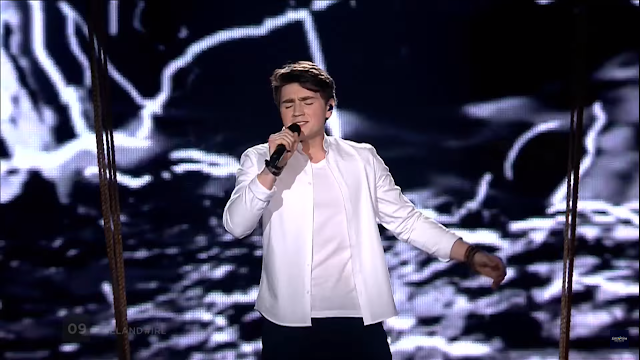 Secondly, the old-fashioned fan in me wanted it in the final because it's an old-style song with a tune, something which, for example, Modern Talking might have done back in the day. However, with hindsight and with fresh eyes, I understood why it didn't qualify. It was too old-fashioned, and rewatching flagged another few things up which might have put the viewers off. The song's concept meant that the duo spent very little time together, and many viewers may not have understood the reason for that. Then there was Laura's diction ("like two silly boats in the sea") whilst she missed her initial cue. Finally, was Koit's stare just too much....? During pre-season I constantly got this entry and Cyprus' mixed up, and I couldn't remember who was Hovig and who was Imri. Basically both of them were eye candy and I was very happy about that, even if neither of their songs particularly appealed to me. There were probably a lot worse ways of spending 3 minutes and it was an energetic performance, so I was ok with this qualifying over, say, Serbia, or Switzerland, which just left me cold. Songs over, and EUROPE! START VOTING NOW! Another episode of Verka's Eurovision journey before a quick segment to meet some of the fans. Interval act time, with a contemporary number by Ukraine's Apache Crew with a piece called "The Children's Courtyard". At one point they were playing one of my childhood favourites - you all know it as hopscotch but in my part of the world it was called peever and you had to play it by throwing a shoe polish tin. But I digress, because my attention was wandering....contemporary dance never holds my attention for too long. After this interval act it was back to the green room with a very big surprise. We've never had a live marriage proposal on air, but that's exactly what happened here as the partner of Jana from FYR Macedonia asked her to marry him and she said yes! Next we had the preview of Saturday's remaining automatic finalists - France and Germany, and this year's host country Ukraine. I got a couple of my predictions wrong in semi-final 2: I'd predicted Estonia and Lithuania to go through in place of Belarus and Denmark. 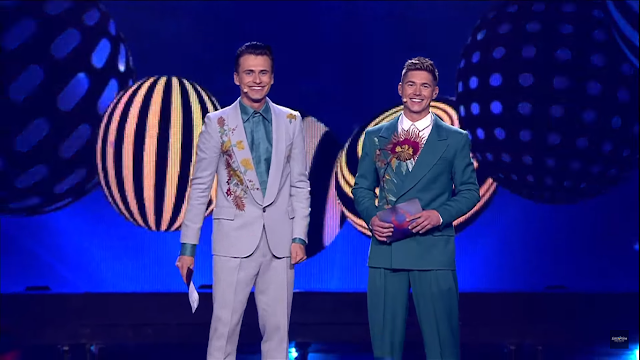 I was delighted for Belarus however, and completely undersood why Estonia and Lithuania never made it. I felt a little bit sad though, that none of the Baltic states (especially Latvia) would be represented in Saturday night's final. Coming soon: my review of the Grand Final.